The Benedict Garden Performance Program was established to identify the very best hostas - those found to be not only beautiful plants, but ones that also perform well in the garden. Each year another great hosta will be chosen to receive the Benedict Medal, our society's highest award for a hosta. Like the Stout Medal for daylilies and the Dykes Medal for irises, the Benedict Medal honors the very best of hostas. The BGP Program follows a three-step process. Plants must first be nominated by the introducer or their representative. Once nominated they are voted upon by the Garden Performance Judges. If a plant has received sufficient votes, it receives the Honorable Mention. In the next year's voting, only Honorable Mention plants are eligible for the Award of Merit. 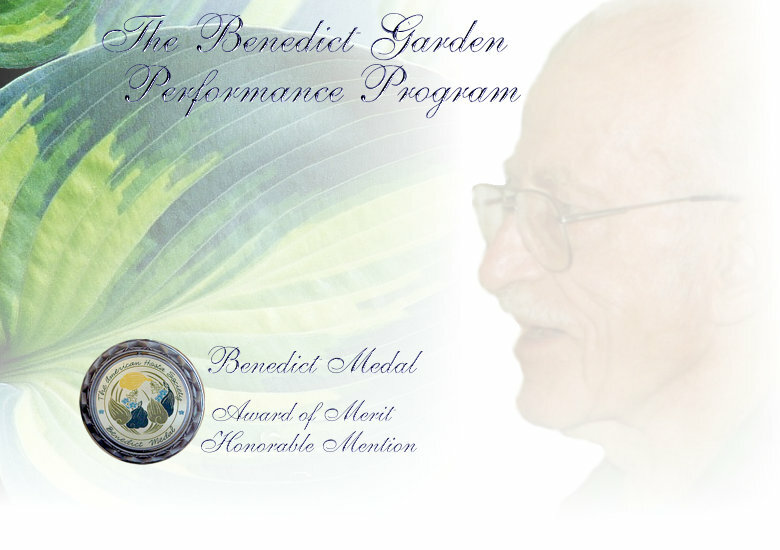 Finally, from the Award of Merit winners a single plant is chosen to receive the Benedict Medal. Plants are eligible for each stage for a three-year period.